Porch railings are more than just a lovely accent to your home! They add safety and style to your porch. Imagine a front porch with historical style railings, a secret garden tucked off to the side and how you'll fell as you walk on a sidewalk of antique pavers. Balustrade systems are a unique part of any architectural master piece. They may be the painted panel spindels or the more larger antiquity balausters. They are both functional and beautiful and can provide the right look for your project. 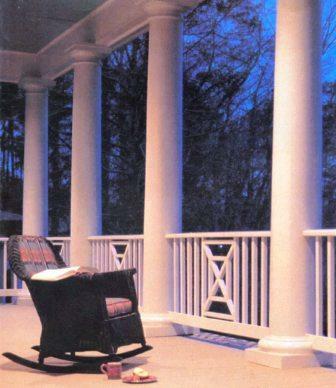 Porch railings enhance any staircase, patio, or enclosed area. Balusters are the main instrument used in balustrade systems to create a desired appearance. Porch railings or balustrades come in many shapes and materials. Decking and support materials are important, but the baluster railing system is where you really make a personal statement. Throughout history, balustrade systems have been used to complement homes. Theey define and beautify entryways, add a touch of finery to porches and can set off rooftops and balconies. Balusters, hand rails and base rails are available in many styles. Ranging in heights from 28 inches to over 42 inches, a variety of balusters, newel posts, newel caps, balustrade railings and accessories are available to create the look you desire. Thinner balusters project a comfortable, simple atmosphere, while thicker more prominent balusters have a colonial or estate feel. Custom, tall, short, round, or square, a suitable style from Classical to the Colonial, the Italianate to the Contemporary can be achieved. Most baluster railings can be custom curved for most any flat radius or radius stair applications. Top railings and bottom railings accent the balusters while the newel posts provide balance. Accessories such as caps and finials finish the look. The installation methods depend on the material and your situation. Many styles are available in many materials. Aluminum, powder coated steel, high-density polyurethane, fiberglass, marble, and resin composites. The marble and resin composite material offers the smooth consistency of natural marble and the structural strength of stone balustrades, reminiscent of ancient architecture, without the added weight. A project is never complete without columns. Columns not only help to provide structural integrity but they also help to bring a design together.